It is a standard 3 1/2 (desktop)drive which will fit in any enclosure. This is provided the interface is correct (ide or SATA). Yeah, earlier in the topic I told him to post pictures of the back or describe what the back interfaces look like so I could help link him to the right kind of enclosures. I think some do both, but I don't know how reliable they are??? Edited by Ferrari, 02 April 2010 - 08:16 AM. It got better reviews than any other casing I saw. The main thing I liked about it is that it seems to have a different port from my last casing (meaning this problem won't happen again), it dissipates heat well, and it has a user-friendly installation guide. The only real problem I have with it is that it's more expensive than some of the other casings, so between that casing and the torx I'll be repaying almost 2/3 the original price I bought the external hard drive for in the first place. If you already had the data backed up and didn't need to get it off of the hard drive, then I would definitely recommend just buying another external. However, what you initially concerned about is getting the data off of it, and for data recovery the price is only as cheap/expensive as how important the data is to you. See? Look at it that way. Also, from the looks of your original enclosure, the drive does seem a little dated, so saving up some money and buying another external may be something you should consider / buy an internal 3.5" bare drive to put in your new enclosure. 320gb SATA HERE. Or, once you get the DATA, make sure you have it backed up on 1 or more other computers along with the external drive, so if it dies, you don't lose your data. Generally, two devices don't die at the same time unless it is due to a fire or natural disaster of some sort. Just some thoughts to consider. I wonder what others think of the external drive enclosure you linked to. Edited by Ferrari, 02 April 2010 - 10:30 AM. I went to Home Depot and showed one of the workers my hard drive, but the screwdriver that the dunce told me to buy has a six-pronged star, whereas mine has five prongs...so now I have to make a return trip to get the right screwdriver. Thank you Home Depot. Edited by Mikeme, 03 April 2010 - 09:31 PM. I always try to remember that people working in stores like this aren't the experts. They are just a regular guy/girl making a little above minimum wage... most don't know much more than the person they are helping. Especially like in Best Buy... drives me nuts!!! I just tell them "just looking, thank you" now because the questions I do have are to advanced for them usually. 1. I didn't plug something in right (I doubt this is the case because because as I mentioned I spent 2 hours following the easy to understand directions, and there was only two things to plug in, but this IS my first time doing this). 2. The jumper is in the wrong position (I also doubt that this is the case since I just left it in the same spot it was in for my previous enclosure). 3. My computer is missing something that is required to read the hard drive. The instructions say that the only thing I need to have installed though is the USB 2.0 driver, which I've had for a long time. Just for reference my hard drive is a PATA, and when I turn it on in its new enclosure it audibly spins/operates as it did in the previous enclosure. I'm trying to use it on a Fujitsu N-series Lifebook with Windows XP. So when you go into "My Computer" it doesn't show up? Located under START. Are you talking about this icon? HERE Or an icon for your external drive? It neither shows up in "my computer" nor in the place indicated in your picture. When I first plugged it in a symbol did appear where your picture indicates, but it soon disappeared and has not reappeared on subsequent attempts. To make sure it wasn't my computer I tested a thumb USB drive and it works fine. An indicator appears as in the picture, a separate window pops up asking what I want to do, AND it appears in My Computer. This is also what happened before my old enclosure broke, but it has not happened yet with this new enclosure. Does it show up in disk management within computer management? Lets take a look at the drives and partitions. On the left side under storage...click on disk management. Make sure the right side showing the drives is expanded so we can see it all. Take a screen shot showing the drives and partitions. Attach it to your reply. Where is your jumper set? You really have only 3 choices. 123Runner solved my problem with his jumper diagram! The fault, unfortunately, was in my assumption that since the hard drive had already been used in another enclosure, the jumper was in the correct position to start off with. 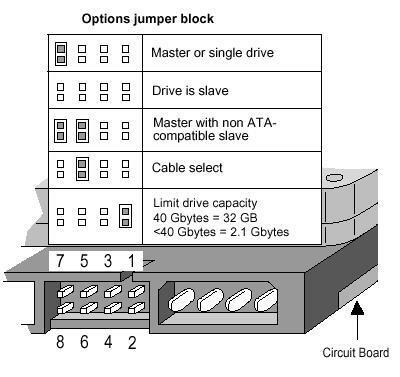 However, upon closer inspection the jumper was set to "cable select" instead of "master", where it needed to be. The hard drive is now completely operable. Thanks to everyone for your help; I learned a lot. Before this topic is closed though I was curious as to how my hard drive was able to operate normally in my other enclosure for 2.5 years with the jumper set to "cable select" instead of "master". Do some enclosures require different jumper settings? Topics are never "completely" closed. As for it working as CS in the other enclosure, "It's the miracle of electronics". We will never know. It could be just the fact something is a little different in the enclosure. That is why we asked you to try all positions. Glad it is finally sorted out.